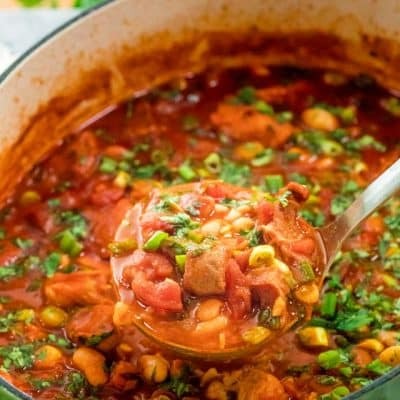 This One Pot spicy Mexican Pork Stew brimming with pork, sausage and beans is a classic hearty dish full of deep Mexican flavor and makes for a delicious and easy weeknight meal. You can’t go wrong with pork and beans, at least not at my house. This is one of those few dishes where leftovers don’t last long here. Pork and beans was one of those dishes that was pretty common in our household growing up, and I’m sure it was and still is pretty common in a lot of homes primarily because it’s a fairly inexpensive dish. We also tend to classify it as a comforting dish and this is quite true. There’s just something really comforting about sitting down and enjoying a bowl of hot pork and beans stew, it’s soul food. Most of us have probably enjoyed the canned version of pork and beans, but I’m here to tell you to throw away that can because these pork and beans will blow your mind. 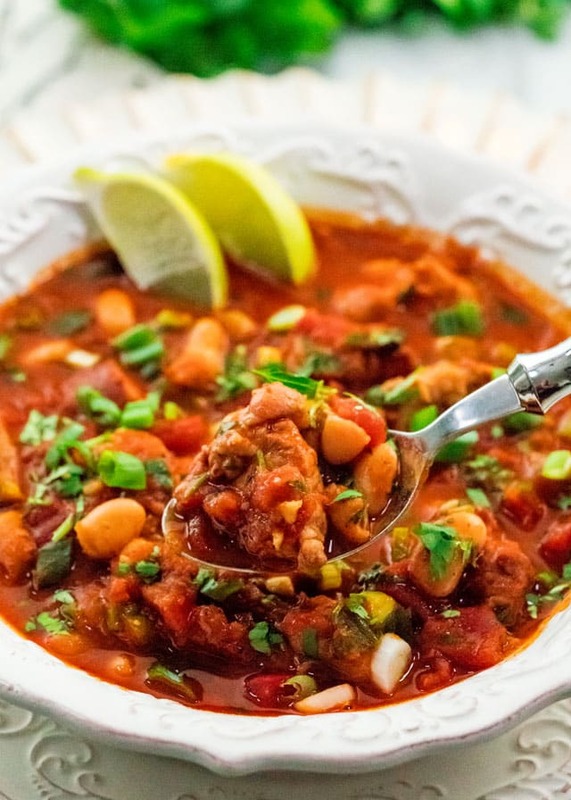 This Mexican pork stew will probably make you never want to buy another can of pork and beans again, not only because it’s that good, but simply because it’s that easy to make. 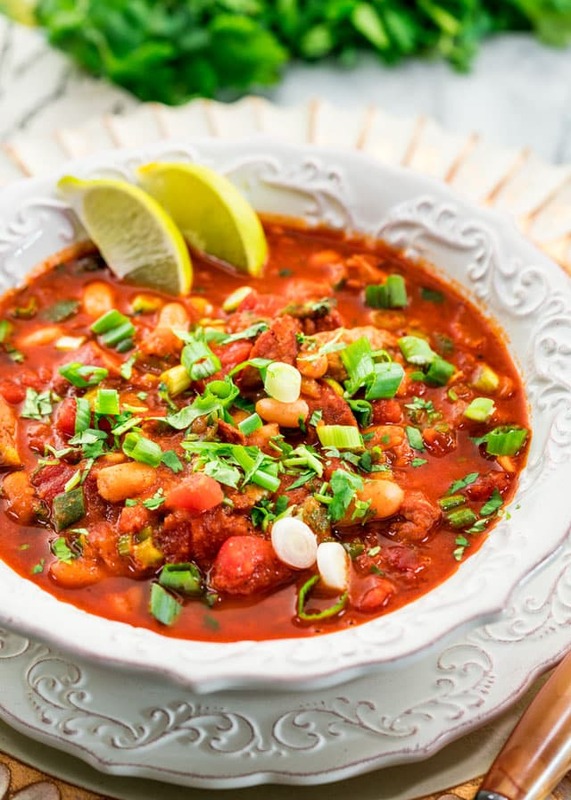 Most traditional Mexican bean recipes will require pork, bacon or some sort of sausage. I decided to go with pork shoulder here and some kielbasa sausage, however if you wanted to go for true Mexican flavor you could choose an Andouille sausage or even a chorizo. I just went with what I had in the fridge, and yes I normally have Kielbasa in the fridge. Don’t ask why, just go with it. You’ll want to cook that meat first, especially since pork shoulder is a fattier meat, so you want to render some of that fat and turn it a bit crispy. If you want to make this a tad bit healthier you might want to drain the fat from the meat before adding the rest of the ingredients, but I didn’t since I wanted to keep that yummy flavor. Once the meat is somewhat cooked, it’s just a matter of adding the rest of the ingredients to the pot and letting it simmer for about 25 minutes. But the beauty here is in the spices. We’re talking chili powder, cumin, cayenne, and I just had to throw in some smoked paprika. The end result is pure bliss. You end up with a stew that’s smoky, spicy, hearty with flavorful and super tender meat. Trust me, thew pork stew is so satisfying and delicious. Make sure to serve this with plenty of cilantro, green onions and don’t forget the lime juice. 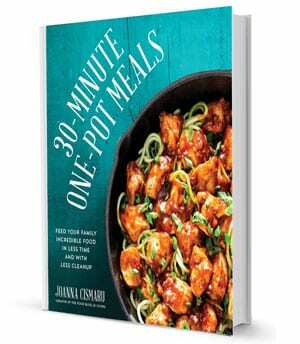 One more great thing to mention is that I’m giving you an alternative cooking method here and that is how to make this in a crockpot. Check out the notes section of the recipe for crockpot instructions! 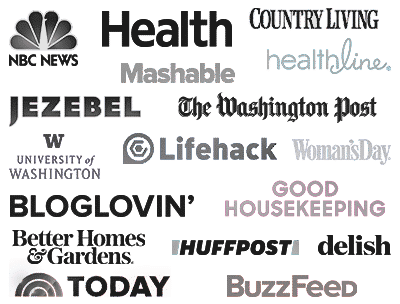 Try some of my other delicious and easy stew recipes! In a large Dutch oven heavy pot, heat the olive oil over medium-high heat. Add the pork and sausage and brown to render some of the fat from the meat, for about 5 to 7 minutes. Drain the fat, if preferred. Add the onion, garlic, jalapeno pepper to the pot. Stir in the spices then add the diced tomatoes, beans and broth. Stir then cover and cook on medium-low for about 25 minutes. Garnish with green onions and cilantro and serve with lime wedges. * For true Mexican flavor, choose an Andouille sausage or chorizo. ** Fire roasted tomatoes would be a great alternative here. Refrigerate leftovers in an airtight glass or plastic container for 3 to 4 days. Freeze in airtight containers or heavy-duty freezer bags for 4 to 6 months. Wear disposable gloves when cutting the jalapeno peppers and avoid touching your face. To make this in a crockpot, follow step 1 to brown the meat then transfer the meat and the rest of the ingredients (with the exception of the green onions, cilantro and lime) to the crockpot and stir. Cook covered on low for about 6 to 8 hours or until the meat is tender. So Delicious! Making it for the second time, thanks for sharing! I added pork chorizo and used pork stew..so good!! Everyone ate so much and loved it 😍 thank you! The recipe was great. I omitted the paprika. I also did not add the sausage, although that does sound good. I was trying to use up pork loin I had already cooked. I just added an addtional pound of pork. I also added a serrano pepper to add additional heat. Delicious!! I used linguica. Also put diced avocado on top with cilantro and green onions. My husband is Mexican and he loved it! Simple but elegant. Great work! Add half a can of Mexican beer to liquid. I’m not a follow the recipe kind of cook but I did mostly on this one. Pleased with the results! Stumbled across this recipe a few weeks ago and tried it out on my husband and myself. We both love it! He really likes spicy food, I do too but can’t cope with too much heat (think Chicken Korma as my upper limit), so I left out the jalapeno, and that resulted in a delicious stew with all of the spiciness transformed into a lovely background heat that worked well for both of us. It has now become one of our firm favourites, and as a bonus it’s so quick to prepare and cook. Thank you for posting this delicious recipe! Wonderful recipe! Superb spiciness and hubby says its definitely a keeper! I just couldn’t figure out what to do with my leftover shredded pork that I haven’t fixed a zillion times already. I wanted something spicy and warming we could eat, with the frigid polar temps we have been enduring here in Michigan. After searching almost 2 hours on the internet, I seen your recipe an thought, ‘ok, let’s give it a whirl’. Most wonderful soup I’ve even eaten with pork in it. Just wish I could show a photo. I’m so happy you liked it! It’s a stable in our house for sure. You can share a photo on facebook. Awesome recipe I make it all the time now, However you all should try Simmering this very low for 40-55 min, Meat melts in your mouth, You can also substitute the pork with chicken and or beef to switch it up a little. Thank you for this wonderful recipe. Made this last night and it was fantastic. Left out the sausage cause I didn’t have it and the cayenne cause my son doesn’t like spicy (but I do!). I added fresh corn, your photo shows corn in the stew but it’s not in the recipe. Thank you for sharing. This is one of the best things I’ve made in recent memory! I have tried a number of your recipes with good results. This one is quickly becoming one of my favorites. I’m not a big fan of hot and spicy, but this recipe does not exceed my tolerance levels. My three year old grand daughter loves it too. Thank you for sharing it. 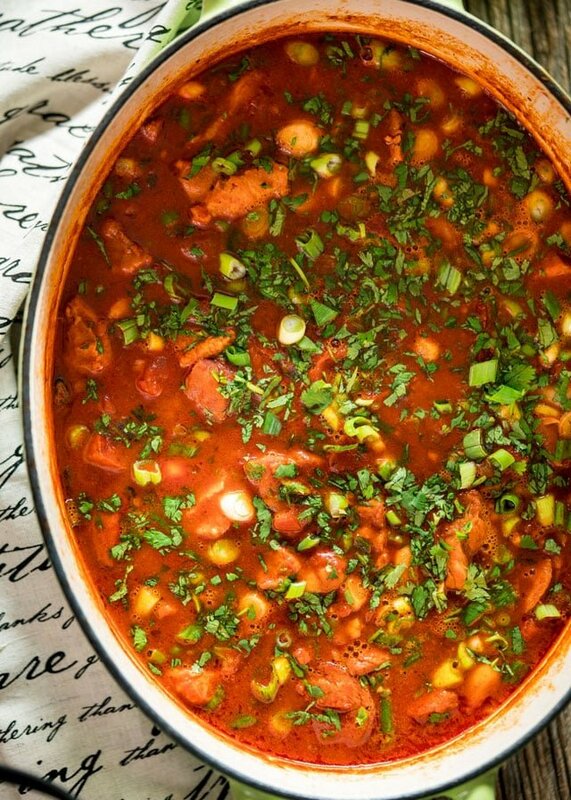 Loved this soup – I usually make Pork posole and it’s good, but this takes the flavor up a couple of notches – I used a boneless pork ribs and dropped them directly into hot water, then took them out 1 hour later to remove the softened fat and trim it off. then cut into small pieces. Sliced Kielbasa was a great complement along with pinto and black beans. I skipped the jalapeno as the other ingredients provided sufficient spice for a kick but not too hot for my 10 year old daughter to eat. So glad you tried out the recipe and liked it and enjoyed it with your daughter. Thanks for commenting and being a part of our Jo Cooks community. Wow! I have been looking for a soup with pork , not a chili that we often eat. we love Mexican food in our home and search for recipes with a traditional Mexican Flair and flavor profile. This recipe was just perfect. Thnx! My wife can not eat spicy foods so you can imagine the food does get a touch bland. I’d like to try the Mexican Pork and Beans, but I am afraid it will be too spicy. Other wise it looks extremely interesting and promising. How can I reduce the spice and which ones can be replaced to keep it interesting? You could take out the jalapeno pepper and the cayenne which would make it less spicy. The rest of it should be okay including the mild chili spice which you could leave in as its more for flavoring than anything. That should work well for you and still give you the taste you are looking for. 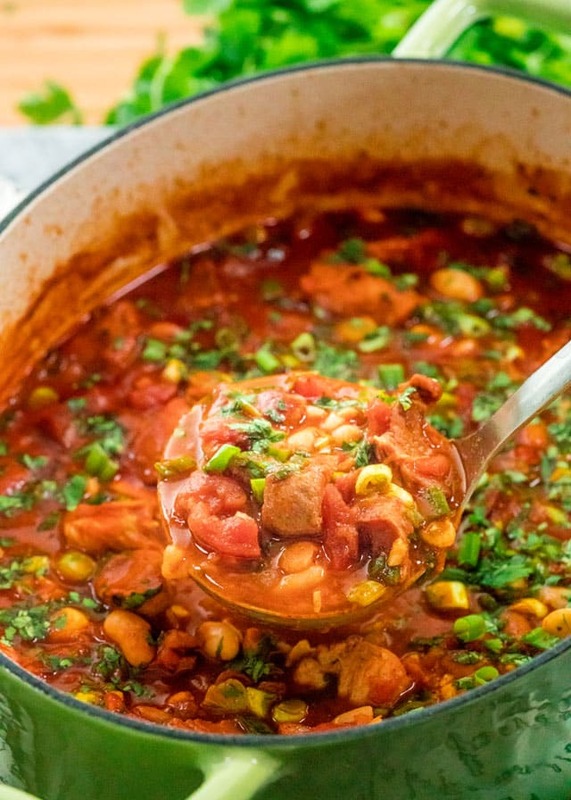 This pork stew looks really nice for a warm dinner, love it! Thanks, look forward to hearing from you when you try it. Thanks for commenting and being a part of Jo Cooks.